“We are grateful to CURE Magazine...for their attention to bladder cancer, a disease that has long been ignored. We know that this effort will help to increase public awareness...." - Monica Smith, exec. dir., BCAN. CURE® Magazine and the Bladder Cancer Advocacy Network (BCAN), whose mission is to advance research, provide information and support, and raise awareness of bladder cancer, have joined forces to battle the fifth most common type of cancer, which begins when the cells in the bladder’s lining start to grow out of control. “CURE Magazine provides guidance to patients and their families at every stage of the cancer experience through digital and print publications, live meetings, a resource guide and other books and online tools. In aligning with the Bladder Cancer Advocacy Network, we are coordinating our many efforts to bring more visibility to bladder cancer, a disease that will strike one in every 42 people in their lifetime,” said Mike Hennessy Jr., president of Intellisphere Oncology and Healthcare Specialty Group, part of the Plainsboro, N.J.-based Michael J. Hennessy Associates, Inc. (MJH) family of businesses. Each year, BCAN provides thousands of patients, caregivers and the medical community with the educational resources and support services they need to navigate their bladder cancer journey. BCAN works collaboratively with the medical and research professionals who are dedicated to the prevention, diagnosis and treatment of bladder cancer and empowers the patient community by allowing them to share their experiences and to participate in building awareness of the need for a cure. “We are grateful to CURE Magazine and its parent organization, Michael J. Hennessy Associates, for their attention to bladder cancer, a disease that has long been ignored. We know that this effort will help to increase public awareness and empower patients with the latest knowledge in the field,” said Monica Smith, Executive Director of BCAN. Leveraging deep relationships within the medical community, BCAN has assembled more than 50 leading urologists, oncologists, radiation oncologists and pathologists working within the bladder cancer field to serve on a Scientific Advisory Board that guides BCAN’s efforts toward awareness and a cure. In 2006, BCAN organized the first scientific conference solely focused on bladder cancer. Hosted annually, the event remains the only conference that convenes leading oncologists, urologists, researchers and patients to enhance collaboration among those dedicated to the prevention, diagnosis and treatment of bladder cancer. CURE Media Group’s flagship product, CURE magazine, is the indispensable guide to every stage of the cancer experience. With nearly 1 million readers, CURE is the largest consumer publication in the United States focused entirely on cancer, with broad distribution to cancer patients, cancer centers and advocacy groups. Through the magazine, live meetings, a resource guide for the newly diagnosed, the Extraordinary Healer™ national nursing award, and other books and online tools, CURE Media Group combines science and humanity to make cancer understandable. CURE Media Group is part of the Plainsboro, N.J.-based Michael J. Hennessy Associates, Inc. (MJH), family of businesses, which includes the acclaimed OncLive® (http://www.OncLive.com) platform of resources for the practicing oncologist. For more information, visit http://www.curetoday.com or http://www.mjhassoc.com. Founded in 2005, BCAN is the only national advocacy organization devoted to advancing bladder cancer research and supporting those impacted by the disease. 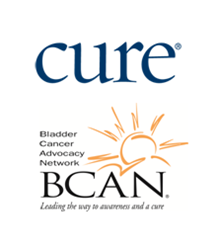 Since its founding, BCAN has been on the front lines advocating for greater public awareness and increased funding for research to identify effective treatments and eventually, a cure for bladder cancer.